A leader in the used package machinery industry, Wohl Associates has added new filler and sealing machinery to their vast inventory of used equipment. 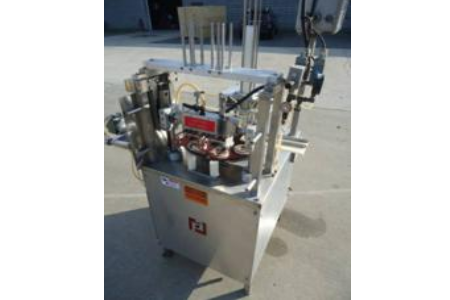 (PRWEB) - Wohl Associates is now offering a used Autoprod RO-A1 Rotary Filler/ Sealer for sale. The used rotary cup filler/sealer is rated to execute up to 50 cups per minute. The machine has stainless steel cabinetry and is set up for an approximately 1-7/8” diameter cup. This rotary filler includes a heat sealing attachment and it has a cup magazine and a 60 cycle single phase electric specification. Wohl is a leading dealer of pre-owned surplus machinery for all industries. They purchase individual machines and even complete lines of used equipment. After acquiring used machinery, they inspect each unit and then sell them to other businesses at market prices. They carry numerous brands of rotary and inline cup fillers and sealers on their site. Popular machines are available from Anderson, Biner Ellison, Comas Mascara, Fairchild, Holmatic, King, Lakso, Merrill, Osgood and others. These filling machines come in single and dual line fillers in capacities to match the volume requirements of any facility. Wohl Associates has earned the reputation as a trusted dealer offering quality equipment and exceptional customer service. They possess invaluable knowledge in the pre-owned processing and packaging industry. Unlike many other dealers, Wohl Associates also purchases available surplus machinery. They may purchase an individual machine from a business or even a complete facility, including their real estate assets. Wohl Associates also specializes in appraising packaging and processing equipment for the pharmaceutical, food, cosmetic and other related industries. Whether an appraisal is needed for insurance reasons, buyouts, loans, or for mergers or acquisitions, Wohl can assist with a qualified appraisal for the customer. Their inventory is constantly being updated to ensure the largest selection of used machinery. New arrivals can be found on their website in the featured machinery section of the home page. Wohl Associates has been a family-owned and operated business for over 40 years. Wohl Associates has earned a reputation as a trusted leader offering quality equipment, expert customer service and invaluable knowledge for the pre-owned packaging and processing machinery industries. They take pride in maintaining long-standing relationships with their customers and service companies across all industries. To view their inventory and learn more, visit them at http://www.wohlassociates.com/.